Probably as good as this movie can be. Really well edited. Ebumms creatively structures scenes not to just excise unfunny bits but also to enhance what is there. The example shown on his youtube channel, of the visit to Pee Stain's house, is a great example of the magic in this. I don't think I laughed once at that scene originally and this edit makes the whole thing enjoyable and hilarious by just making you forget that any of that brake-screechingly unfunny stuff was ever there. 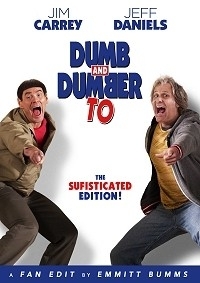 I think this elevates the movie to a decent blockbuster comedy with a much better laugh to watch ratio than the original. It still is wildly less creative than the original. The tech convention is just a boring location and Harry and Lloyd never really have to do too much. Rob Riggle's death involves no chaotic bits of causation like the hot sauce and pills scene in the original. He just gets hit by a train. Rob Riggle being a twin is absolutely wasted. Why does he reveal himself to be a twin immediately? Mistaken identity is ripe for comedy and could have been built into a crazy hay-wire finale instead of a dull shot-reverse shot stand-off that fizzles out with spoken exposition. It all just feels very low stakes (production design-wise) despite having quite a larger budget than the original, even after adjusting for inflation. Maybe some money fleecing like the more obvious "Jack and Jill"? Anyway, that's enough about the stuff that can't be changed. This edit definitely makes it a watchable comedy, though, and that's no small feat. I can see me re-watching this and I had no desire of revisting the original cut. File looked great, nice encode. I saw the most recent revision, released this year of 2018. Great job!